Lightning Box Games has just released Panda Pow! slots, a game that will appeal to anyone who enjoys oriental themed slots. It is a 5 reels slot with 25 fixed paylines. The reels are set in a gold frame against a red background. The high value symbols are a panda on a branch, a goldfish, some gold coins, a Chinese lantern and a blue fan. The wild and scatter symbol are combined into one, it is the panda with a red bandana and it can land on reels two, three and four. Landing five, six, seven, eight or nine of the wild symbols anywhere on the reels awards 5, 8, 12, 15 or 20 free spins respectively. 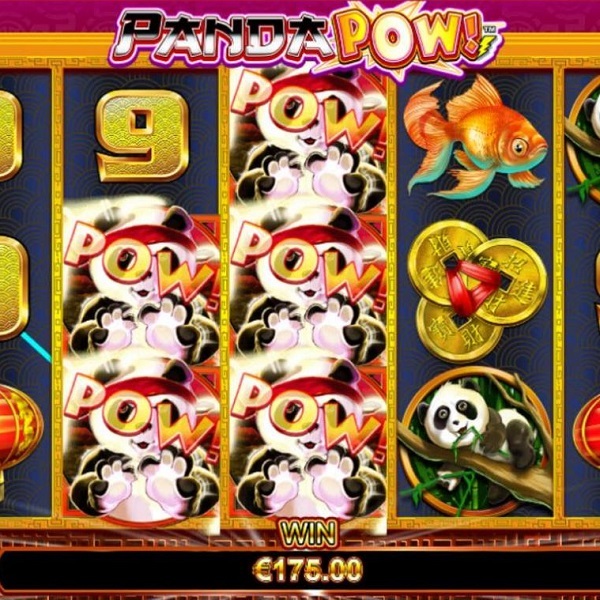 During the free spins there is a wild golden panda symbol added to the reels that can land stacked and it is possible to win more free spins.